You need a healthy, strong smile to enjoy your favorite foods, speak and laugh with friends, and maintain good overall health. If dental damage or decay has left you struggling, don’t wait – reach out to Collins & Montz Dentistry and start exploring your restorative care options. Dr. Collins and Dr. Montz use state-of-the-art technology and high-quality materials to rebuild lacking tooth structure in exceptional ways, and we do our best to keep you feeling comfortable and at ease throughout your appointments. Contact our Melbourne Beach, FL office today to schedule your first appointment with our team. A dental crown is designed to cover a single tooth’s entire visible shape, which allows patients to maintain the natural material underneath while rebuilding the tooth’s structure, appearance, and ability to function properly. 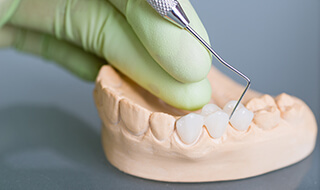 Dental crowns are also regularly combined with bridges, which can replace one or more consecutive missing teeth within the mouth, provided that there are still healthy teeth located on either side of the gap. The crowns are placed as “anchors” that cover the adjacent teeth and hold the bridge securely in place for a permanent, reliable result. 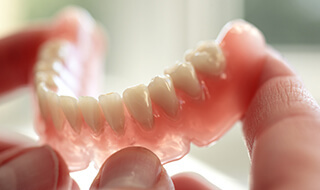 Implant-retained bridges are also available at Collins & Montz Dentistry! Nearly 92% of the population will experience one or more cavities over the course of their lives. If your number is up, you might be hesitant to pursue a dark, metal filling that will hurt your smile’s overall appearance. Thankfully, you don’t have to worry about this any longer at our Melbourne Beach, FL practice – tooth-colored fillings are here to stay! Dr. Collins and Dr. Montz use high-quality composite resin that’s been precisely shaded to match with your natural enamel, sculpting it in place within the tooth so that it forms a direct bond and repairs the damage left by dangerous bacteria. In addition to being aesthetically pleasing, tooth-colored fillings are conservative (meaning we’ll be able to preserve even more of your natural tooth) and less prone to temperature-related sensitivity. 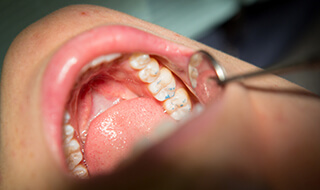 Do you have an existing metal filling that you’d like to replace? Let our team know. We’d be happy to switch it out with a new, tooth-colored model that preserves your oral health while helping you smile with more confidence. One missing tooth is a serious concern, but several gaps can be absolutely devastating to your oral function and your sense of self-confidence. 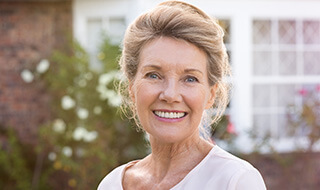 Dentures have been around for hundreds of years, and today, they can still provide a reliable, affordable solution to extensive tooth loss. Dr. Collins and Dr. Montz offer both full and partial removable models here in Melbourne Beach, as well as implant-retained prosthetics that provide a greater degree of permanence and stability. Your teeth might seem simple on the outside, but they actually contain several different layers that go all the way down to a sensitive inner pulp. 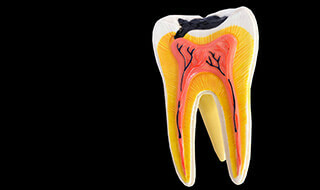 If an injury or deep cavity manages to penetrate this layer, it can result in a severe infection, painful aching, and even the threat of extraction. Thankfully, root canal therapy from Collins & Montz Dentistry may be able to save the day. During this procedure, we’ll access the inside of the affected tooth and clean out diseased pulp from the root canals, replacing it with a safe, biocompatible substance before sealing the structure shut once more. With today’s advanced technology and anesthetics, this procedure is simpler, more comfortable, and more successful than ever before! Extraction is never our first choice for your smile by far, but it may become necessary if a traumatic injury, advanced periodontal disease, or severe tooth decay is wreaking havoc. Additionally, teeth could need to be removed for orthodontic treatment, or if your son or daughter requires a baby tooth to be professionally extracted to safely make way for the emerging adult tooth. 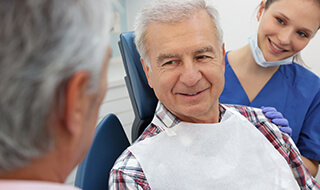 Whatever the situation is, our team will handle this procedure as comfortably as possible, and if necessary, we’ll have the ideal tooth replacement solution waiting in the wings to help you regain a complete, capable smile right away.